With its rich farming history, Long Island is home to various animals that help tend to the land and produce food., while others animals are here seeking refuge, being rehabilitated from an injury. And we're lucky enough to view and encounter marine life at a local aquarium. We've compiled a list of places on the East End of Long Island where you can learn about animals, experience hands-on encounters and even kiss a sea lion! In addition, visit some of these Family Friends Farms on Long Island, and for more ideas on how to spend your time in the area, check out our North Fork and Hamptons Guide as well. At this Cornell Cooperative Extension, kids can attend a variety of classes through the end of the summer; including learning about baby animals. On Farm Tour Tuesdays throughout the summer, you can get a tour of the farm, meet the animals and hop on a wagon ride. Visit the butterfly house as well. The entire mission of this museum is to foster the knowledge and appreciation of the animals and nature that surrounds us here on Long Island. A large touch tank downstairs allows little hands to pet various marine life, while an educator explains their species and purpose. Upstairs, there's an interactive, life-life display of animal life (including a guess the animal poop exhibit!) Weekly events are offered for children (and adults) of all ages. Head onto the deck for expansive views and outside for a nature hike. This 187-acre peninsula on Noyack and Little Peconic Bays, boasts exceptionally diverse habitats. Sandy and rocky beaches line the shore. A variety of wildlife including white-tailed deer, eastern chipmunk, painted turtles, green frogs, songbirds and osprey can be observed. Waterfowl, such as long-tailed duck, common goldeneye and white-winged scoter, are common during the winter months, while piping plover, terns, and other water birds use the beach during the spring and summer months. On Saturdays, there are guided walks and family-friendly activities offered. Tip: Stop for sunflower-based bird seed on your way in and they will nibble directly from your hand. This tucked away lake-front establishment is home to various wildlife, including some that are permanently injured and require constant care. Inside you'll find a trio of tortoises, birds, reptiles and a panoramic view of the lake from floor-to-ceiling windows. Head outside to the barn that houses an ice harvesting exhibit (think the opening of Frozen). Caged exhibits include a falcon, eagle, red fox and more. Continue on the path for a choice between three hikes around the lake. Be on the lookout for animals and hidden spots. View, pet and feel various animals at the Long Island Game Farm. Animals include an 18-foot giraffe, red kangaroos, kinkajous, cougars, Barbados sheep, peacocks, and the only lemurs born and bred on Long Island. The animal collections include both exotic and indigenous breeds, including monkeys, buffalo, parrots, zebra, aoudads, camels, ostrich, alligator and more. Bonus: Purchase tickets for various carnival-like rides on the grounds! The twice-daily show, David Rosaire's Pekingese Dog Act is running through Sept. 1. Pony rides are free every day, as is the baby animal farm, where you can sit and hold bunnies and guinea pigs. Continue on to see monkeys, llama, deer, wallabies, mini cows, mini horses, ponies, piglets, goats, sheep, emus, parrots, tortoises, chickens, ducks and more. Take a scenic train ride throughout the entire grounds (additional fee). Picnic tables are available. A few playground areas are also on site. Upon entering the doors you can start your hands-on experiences at the Aquarium by petting and feeding sting rays and turtles. 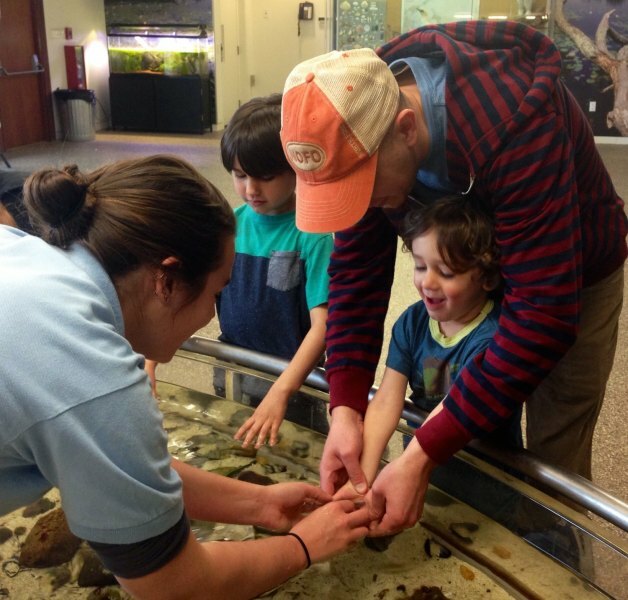 A touch tank allows visitors to get an up close look at various marine life. Pop into the butterfly and bird exhibits and birds will find a perch right on your hand, shoulder or head. Just outside the bird exhibit, hundreds of colorful butterflies flitter about--some even landing on your clothes or body. Outside you can wade through a salt marsh while crabs and other creatures crawl right by. Take in a live seal show or enjoy a boat ride around Peconic Bay. Pack a picnic lunch for outside dining or you can purchase food from the concession stands. Staff offers lectures/feedings throughout the day as well. Throughout September, kids can try their Train a Seal, Kiss a Sea Lion program for an extra-special encounter.